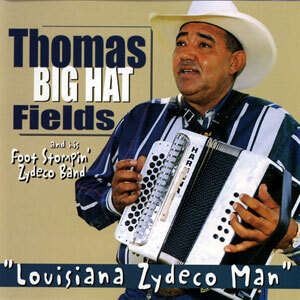 Thomas “Big Hat” Fields was born in the “Frog Capital” of Rayne, Louisiana on May 10, 1947. The only musical history in his family was a great grandmother that played the accordion on some old-timey Creole ‘la-la’ music for family and house parties. Unlike most zydeco musicians, he didn’t play an instrument until later in light. As a young man he had no intention of becoming a musician. Some of his early ventures in life included bartending, part-time club bouncer and occasional manager at local clubs and lounges, some rodeo riding and horse training and the building and cement finisher trade. Then, in 1991, he bought a club in Grand Coteau, appropriately renamed the Big Hat Club. He soon had all the top zydeco acts performing there. It was then that he decided to learn to play accordion. He was taught to play by Paul Harris, a contemporary of Clifton Chenier’s, and soon after starting performing with the house band at his club, Pee Wee and the Boll Weevils. Later, encouraged by his reception, he formed his own band, which included his wife, Geneva, who had to learn bass guitar from scratch, and started composing new songs. His distinctive sound and affable personality have made Thomas Fields and His Foot Stompin’ Zydeco Band a popular band on the national zydeco scene. For me it doesn’t get anymore original or authentic than listening to Thomas “Big Hat” Fields and his Foot Stompin’ Zydeco Band. So when I received my copy of Field’s latest studio release, “Big Hat Zydeco Mix” I expected excitement, and I wasn’t disappointed. Thomas Fields is a zydeco pioneer as well as a living legend in his hometown of Rayne, Louisiana, where he was born 57 years ago. “Big Hat Zydeco Mix” is Fields’ first release in nearly five years, and it is damn well worth the wait. With his signature baritone voice and smooth Creole style, Mr. “Big Hat” sails through fourteen tracks of zydeco, blues and swamp-pop material that will have the listener yearning for another recording without having to wait five long years. To listen to Thomas Fields you would never know that he began performing somewhat later in life, while in his forties back in the early 1990s. Although he’s only been on the zydeco road for a little more than a dozen years, Thomas Fields is clearly leaving his mark on the genre and on the Louisiana music scene as well. The man radiates Creole rhythm, raw emotion, and a soulful spirit in his music. And it’s all been beautifully recorded on this latest CD. Among the outstanding tracks featured are: “Tout Les Temps En Temps;” “Coeur Fait Mal,” “Country Woman,” “Big Hat Stomp,” and “Pretty Catherine.” As if the music featured on this CD isn’t enough to get you stompin’ in place, Fields is backed up by some of the best personnel in the business. The members of his Foot Stompin’ Zydeco Band, include Geneva Mouton (bass, vocals), Marty Christian (guitar, vocals), Joseph Edwards (drums), Jean Pierre Audet (harmonica, scrubboard), Rodney Bernard (scrubboard, vocals), Curnis Andrus (saxophone) and Thomas Fields (triple row and traditional four stop accordions and vocals). Thomas Fields’ sound is somewhat in the tradition of Roy Carrier while his recorded banter is reminiscent of the late Louisiana chef Justin Wilson. But, Fields is no follower. He is a true original blazing his own trail and hell bent on keeping the Creole zydeco sound alive and well. “Big Hat Zydeco Mix” is a four-pepper CD worth waiting for! Josef “Big Red” Arline grew up in Hillster, Texas and eventually became interested in blues which eventually led him to Zydeco. He spent most of the 90’s as a studio singer and performing as a lead singer in a Reggae band. He eventually formed his current band, the Zydeco Playmakers, and after struggling for a while finally issued his debut, “Secret Ingredients.” Big Red plays southwest Louisiana/southeast Texas Zydeco which is strongly rooted in the blues and has a mostly traditional feel. “Secret Ingredients” is one of the hottest Zydeco records I’ve heard in some time as Big Red is a wonderfully soulful singer and energetic accordion player backed by a tight band that lay down an infectious groove. “Recipe” has a great hook and should be hit if there was any justice, “I Can Still Remember” is a chugging R&B number, the classic “Hot Tamale Baby (big red style)” is given a fine workout and “Don’t Let The Green Grass Fool You” finds Big Red at his soulful best. A fantastic debut that should put Big Red in the front ranks of the newer Zydeco performers. 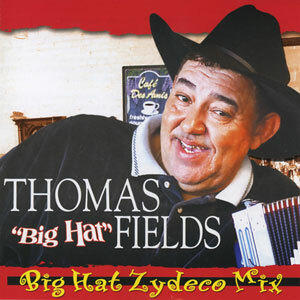 Thomas “Big Hat” Fields got a late start on the Zydeco scene. In 1991, he bought a club he renamed the Big Hat Club which soon had all the top zydeco acts performing there. It was then that he decided to learn to play accordion and was taught to play by Paul Harris, a contemporary of Clifton Chenier, and soon after starting performing with the house band at his club. He formed his own band, which included his wife, Geneva, who had to learn bass guitar from scratch, and started composing new songs. After issuing records for the Lanor label he moved over to Maison de Soul and issued the excellent “Louisiana Zydeco Man” in 1999. Fields’ and his appropriately named Foot Stompin’ Zydeco Band play a brand of traditional Zydeco laced with a strong blues and swamp pop vibe. Fields, who speaks Creole French, wrote most of the songs on “Big Hat Zydeco Mix with the majority in English, but several also in French. Fields’ and the band stomp through good time Zydeco numbers like a blazing cover of Clifton Chenier’s “Tout Les Temps En Temps”, bluesy swamp numbers like “Hey Hey Therese” and “Country Woman” and the throbbing R&B groove of “Build Me A Man” based on Slim Harpo’s “Scratch My Back” and featuring fine vocals by Geneva. Other highlights include the rocking instrumental “Big Hat Stomp” and a wailing cover of “Talk To Your Daughter” sung by Marty Christian. These guys cook! Maison de Soul has done it again with two terrific Zydeco records. You may not hear much about the Zydeco scene if you’re outside of Louisiana and Texas but judging from these records the scene is thriving and the tradition is certainly in good hands with these two gentleman.